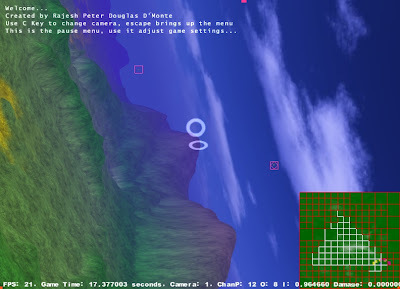 Finally the long awaited update to the flight action game I have been building is done. Now, the target and target queue system is ready, so you can cycle through targets using the 'B' key and if its lockable, you can fire a missile. Even if no target is locked, you can still fire missiles, but they'll probably hit nothing, so there's no point in firing them right? Apart from this, the Game code has been made more OOP and the motion blur in the engine has been made a little less expensive in terms of CPU cycles. The Heads up display (which at present is just the target display) even shows enemies that are off screen. The miniature map now is textured, and the texture's resolution is 4 times less than the original map texture's resolution. Apart from this, the AI has been slightly improved and is now kicking arse, although I haven't written the code for the AI to launch missiles, it will be done in a day or so. Stay tuned, a download-able demo is coming soon!